The U.N.C.L.E. series has generated an amazing amount of collectibles. You can find U.N.C.L.E. 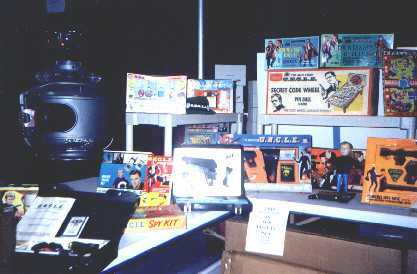 dolls, toy guns, bubble gum cards, and lots more. In its hey day, you can also buy U.N.C.L.E. turtlenecks so that you can be just like a certain Russian spy! In the near future, we will be updating this section to include a more thorough introduction of what is available. The authors of THE TOY BOOK, Gil Asakawa and Leland Rucker, have kindly permitted us to reproduce an excerpt that discusses U.N.C.L.E. merchandise. The book is unfortunately out-of-print. However, if you visit Gil's home page, you can read the Introduction from the book and find out more about him and his other interests! HOW MANY DO YOU RECOGNIZE? 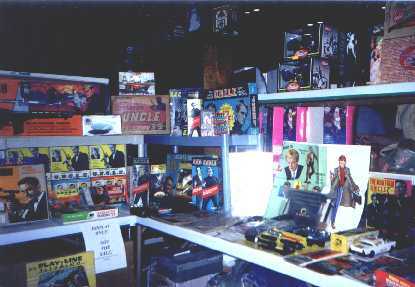 Long time fan Darlene Kepner sent these pictures in from a memorabilia show in Florida in 1998. How many can you identify and how many do you own?